TDHI - TD-120 - Continuous Oil In Water Monitor by Turner Designs Hydrocarbon Instruments, Inc.
Turner Designs Hydrocarbon Instruments has been the world leader in oil in water monitoring for more than 20 years.TheTD-120 Oil in Water Monitor was developed based on our extensive real-world experience and offers UV fluorescence technology with industry leading features. The TD-120 is available with either a standard care package or custom care package to match the needs of your site conditions and application.The customer care packages include calibration to known standards or calibration to your target hydrocarbon, using sample analysis—making your installation and start-up process trouble free.The TD-120 is ideal for detection of oil leaks and spills for heat exchangers, boilers, and membrane systems as well as optimization of water treatment systems. With low detection limits and greatly extended detection range, the TD-120 provides the necessary tools and ease of use to meet today's complex oil in water needs. The TD-4100 utilizes a non-fouling, non-contact flow cell which requires little to no maintenance, and uses fluorescence technology to accurately detect oil in water from low ppb to high ppm. For this application, the TD-4100 monitors oil in water at 1 to 5 ppm and signals an operator with an alarm when the concentration exceeds the high alarm relay set-point. A plant located in the eastern United States manufactures phenolic resin for applications in plastics molding. This plant uses well water for cooling its reaction process and then discharges the water into a local creek. Naturally occurring organics in raw water are typically removed with chemicals. Total Organic Carbon (TOC) analyzers in the water treatment system can alert technicians when generic organic material is present but cannot differentiate between natural organics, such as algae or decomposed plant matter, and hydrocarbons. Using UV fluorescence technology, a properly configured TD-4100XD can alert operators to upsets caused by hydrocarbons such as gasoline, diesel, fuel oil, and crude oil. Fluorescence-based oil in water monitors from Turner Designs Hydrocarbon Instruments have been used extensively in industrial water processes for more than 20 years. These low maintenance fluorescence monitors have no significant measurement disturbance from water turbidity or naturally occurring organics in the water. Oil in water monitors can help detect and prevent major oil spills that may cause significant environmental damage and regulatory compliance infractions. 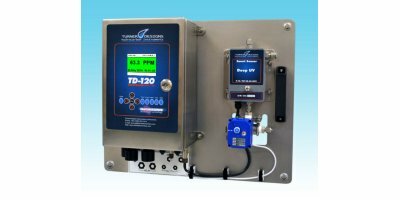 A brief overview of the TD-120 Oil in Water Monitor from Turner Designs Hydrocarbon Instruments. This video discusses the operation, parameters, and industry applications of this rugged, affordable online monitor. Brief instructions for mounting the TD-120 monitor to a vertical surface and making connections. How to use the key pad to trigger a fresh water flush of the Smart Sensor (flow cell). The functionality check verifies that the TD-120 monitor is able to be calibrated and make accurate measurements. NOTE: When injecting solutions while the fluid lines are not connected to the process, all disconnected lines must be filled with water and connectors submerged in a container of water to prevent air from entering the flow cell. Step-by-step instructions for manually cleaning the Smart Sensor (flow cell) with cleaning solution and a brush. The modular design of the TD-120 Oil in Water Monitor makes it easy to swap a Smart Sensor (flow cell) for minimum downtime. Using the internal touch screen tablet and Luer-Lok port to calibrate the smart sensor. Turner Designs Hydrocarbon Instruments is pleased to announce the launch of the new low-cost TD-120 oil in water monitor. Available now for immediate delivery, the TD-120 is ideal for detection of oil leaks and spills in heat exchangers, boilers, and membrane systems as well as optimization of water treatment systems. With low detection limits and greatly extended detection range, the TD-120 provides the necessary tools and ease of use to meet today’s complex oil in water needs. TDHI Inc announces the launch of the new low-cost TD-120 oil in water monitor. Available for immediate delivery, the TD-120 is ideal for detection of oil leaks and spills in heat exchangers, boilers, and membrane systems as well as optimization of water treatment systems. With low detection limits and greatly extended detection range, the TD-120 provides the necessary tools and ease of use to meet today’s complex oil in water needs. For more information, please contact us. Reviews have been disabled for TDHI - Model TD-120 - Continuous Oil In Water Monitor.